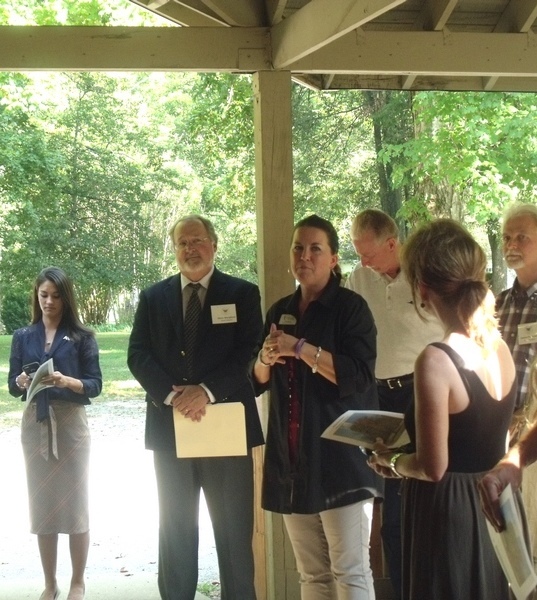 The Rutherford County Chamber of Commerce held a ribbon cutting ceremony for the new Sam Davis Home Arboretum on September 10 at the Historic Sam Davis Home and Plantation. Biology Professor Dr. Steve Murphree, who serves on the Home’s Board of Directors, made a few remarks and thanked Dr. Darlene Panvini and the Belmont biology students for their work. Dr. Panvini’s Fall 2015 Botany class visited the site, collected tree leaf specimens, prepared herbarium specimens for both the Belmont biology collection and a collection at the Sam Davis Home and identified 41 species. The Sam Davis Home Arboretum has 35 tree species marked, and an application has been submitted to the Tennessee Urban Forestry Council for Level I certification. The Sam Davis Home Arboretum is located at the Historic Sam Davis Home and Plantation, a 168-acre site managed by the Sam Davis Memorial Association which educates visitors about the story of Sam Davis, his family and people who labored on this Middle Tennessee farm in the nineteenth century. Many of the trees were on the property when the Davis family lived there in the 1860s, including the white oak to which Sam Davis tied his horse on his last visit home before his capture.